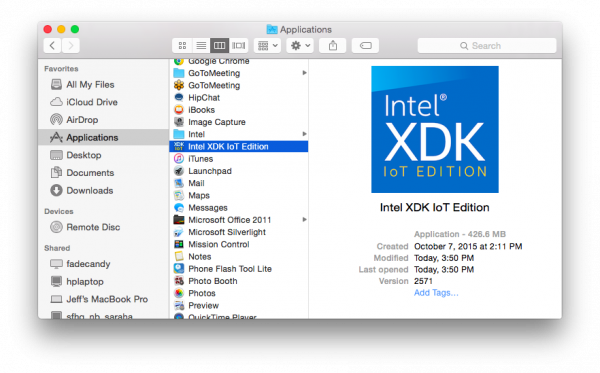 The Intel® XDK is Intel's integrated development environment (IDE) for creating, testing, and deploying mobile apps. 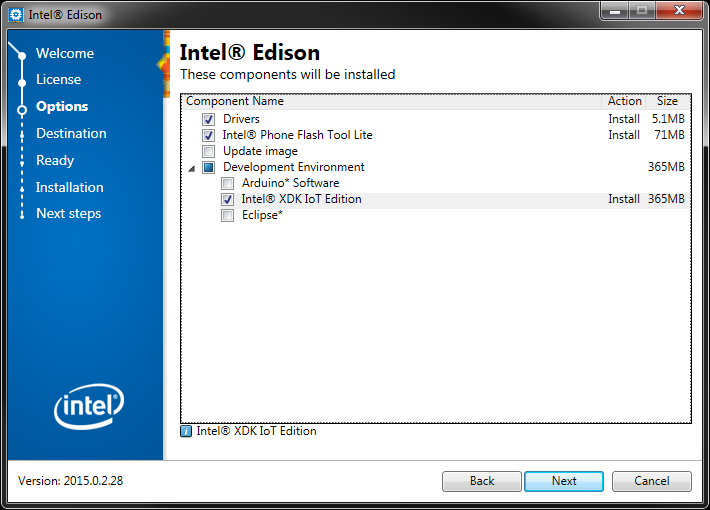 We will be using the XDK IoT Edition, which was specifically designed to help users develop Node.js and HTML5 applications for the Intel® Edison and Intel® Galileo. 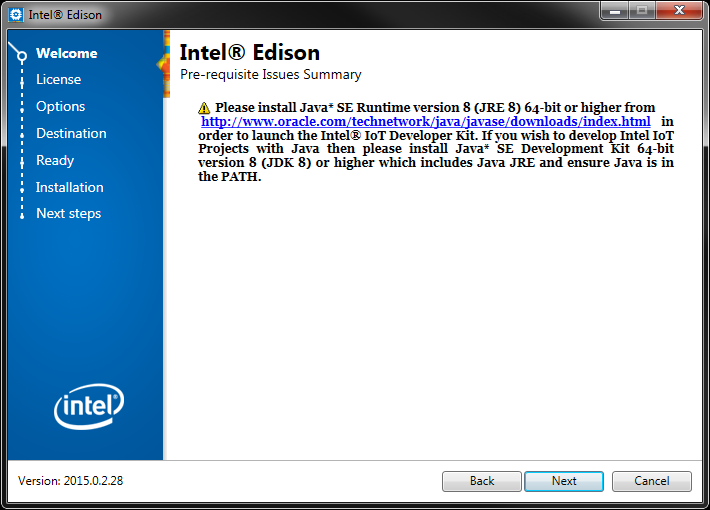 NOTE: You will need to sign up for an Intel® Developer Zone Account to use the XDK. If you would prefer not to use the XDK, you can program Node.js applications directly in the Edison (you will just miss out on cool things like code completion, and you might have to skip some of the phone app exercises.). 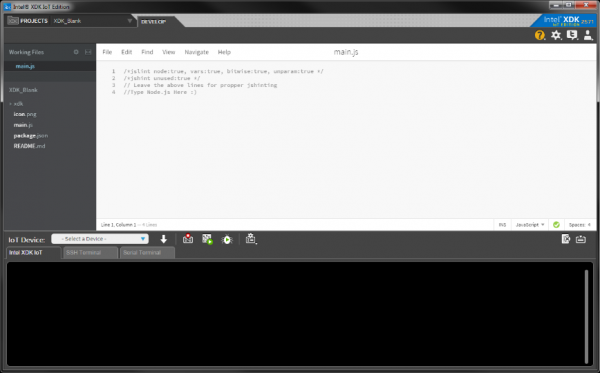 Visit Appendix B: Programming Without the XDK to learn how. 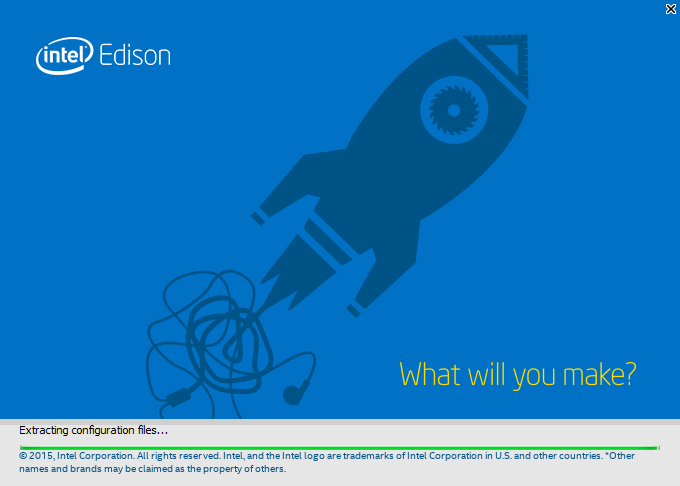 WARNING: Make sure you do not have any Edisons plugged in to your computer for the installation! Run the Installer that you just downloaded. You will see a splash screen as it unzips and prepares to install. Click Next to continue the installation process. The ubiquitous License Agreement will pop up. Feel free to read it (or not). Select I accept the terms of the license and click Next. You will then be presented with options to install. 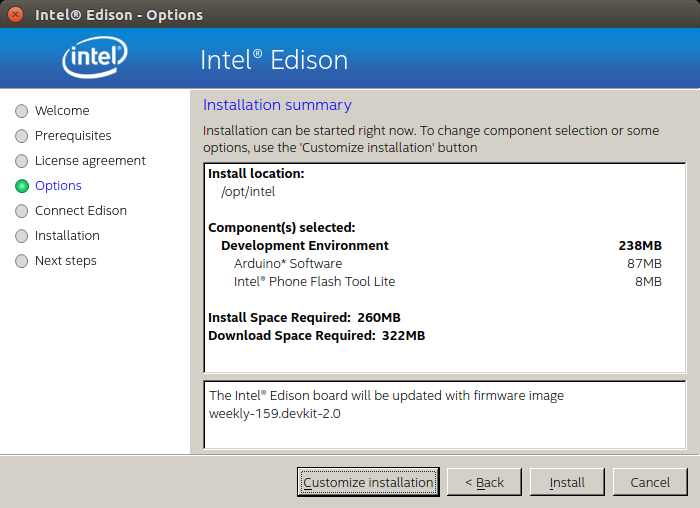 Deselect Update Image (we will do that separately in the next section), deselect Arduino Software, and select Intel® XDK IoT Edition. Click Next. On the next screen, make sure that you have enough space to install the programs. Leave the installation directory as default. Click Next, verify that the installation summary looks correct, and click Next again. Wait a few minutes while the installation completes. 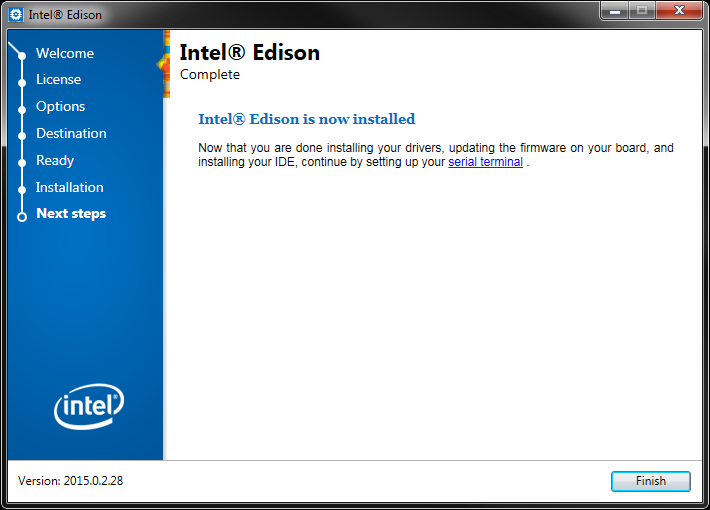 NOTE: The installation process might attempt to install other drivers and programs. Accept all the defaults and choose to install additional programs. This is especially true on Windows where the Installer will want to install drivers, which are necessary for deploying code to the Edison. 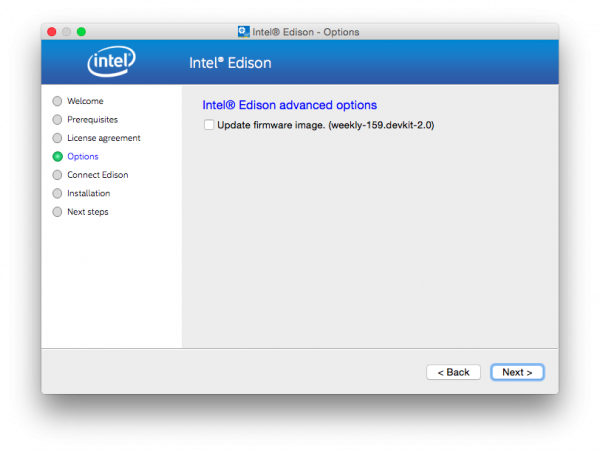 This includes things like "FTDI Drivers" and the "Phone Flash Tool Lite." Also, if the installation seems to have frozen, check for new windows that may have been opened. Once the installation process is done, you will see a "Complete" window. Click Finish. If the Intel® Phone Flash Tool Lite opened during the process, you can leave it open if you wish (we will use it in the next section). The installer or drivers may ask you to restart your computer. The OS X Installer link will download a .tar.gz file. Double-click on that file to extract it. 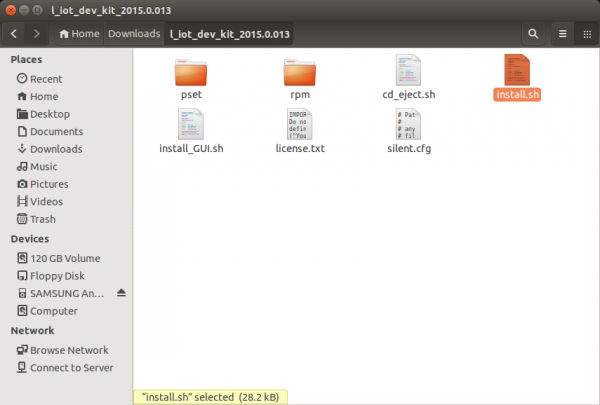 Double-click on the extracted file to run the installer. Follow the prompts, clicking Next to advance to the next screen. 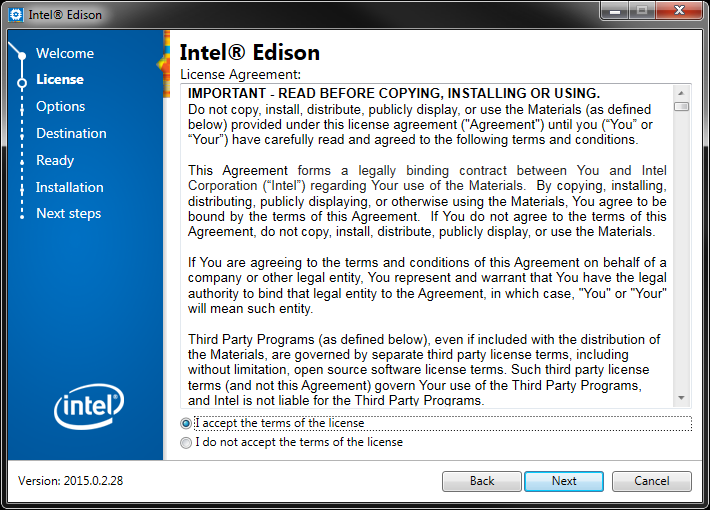 Accept the End User License Agreement when prompted. 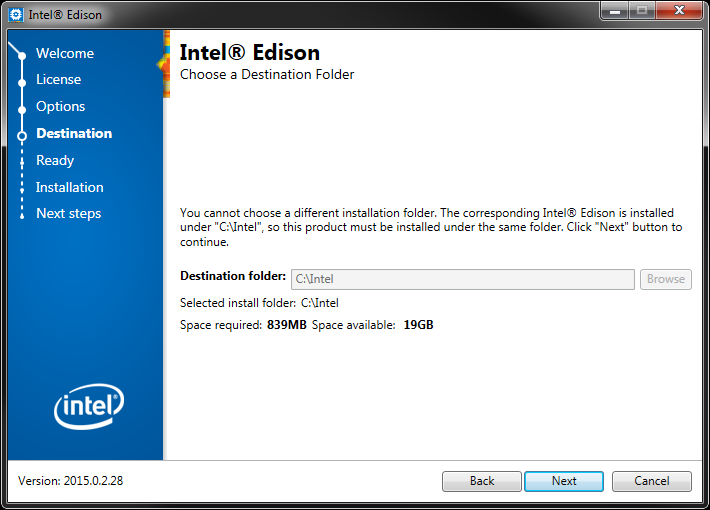 On the Installation summary screen, click Customize Installation. Keep the destination folder (/Applications) at the default and click Next. You will be presented with the option to select the components to install. Deselect Arduino Software, and select Intel® XDK IoT Edition. 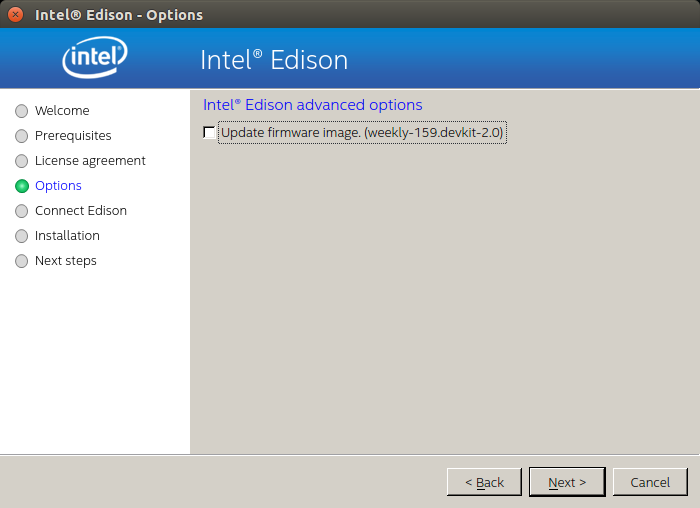 Click Next and deselect Update firmware image (we will do that manually in the next section). Click Next and then Install. Wait while the installer downloads. 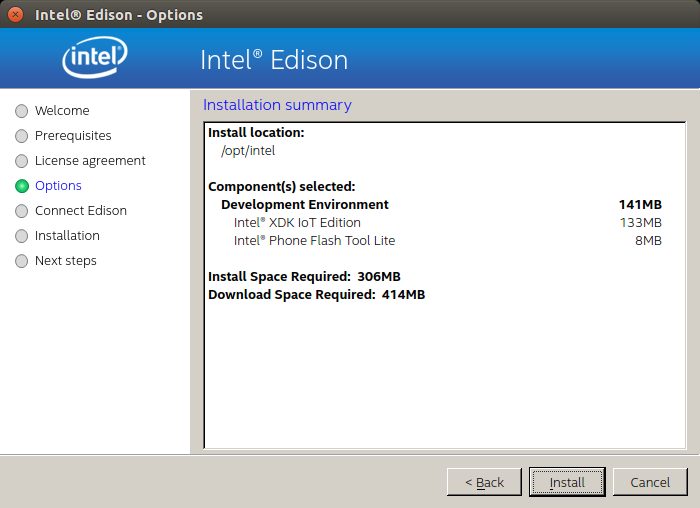 You will then be prompted to install the Phone Flash Tool Lite. Click Continue and follow the prompts. 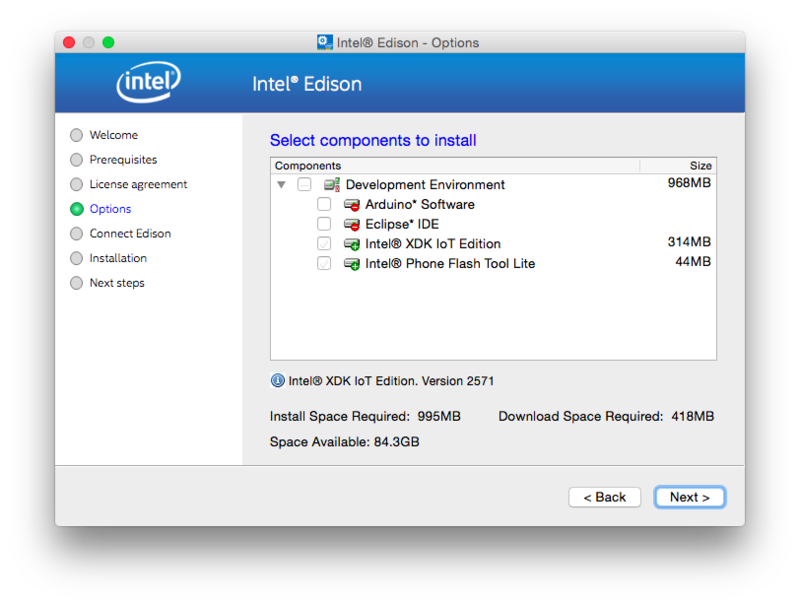 Once the XDK has finished installing, the XDK can be found under Applications. 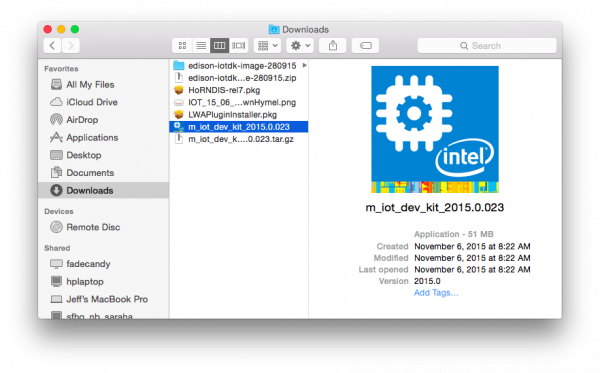 Download the installer, double-click on the file to extract it, and navigate into the directory that it creates. Double-click on the install.sh script (select Run if prompted) to begin the installer. If you want the XDK to be available to all users, select Install as root. 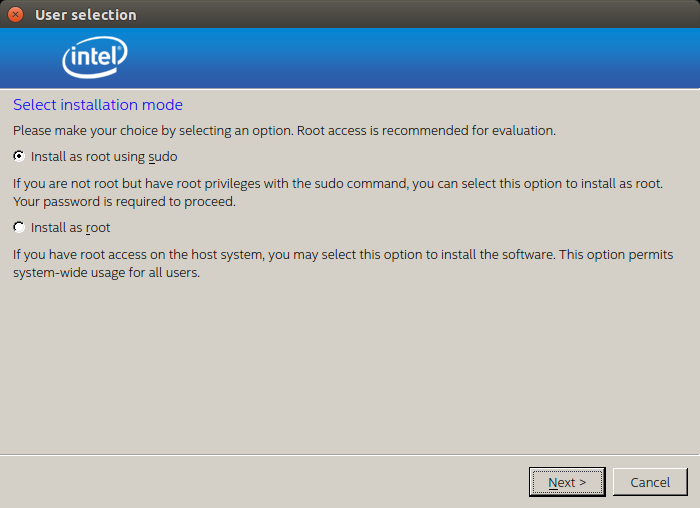 Otherwise, select Install as root using sudo. 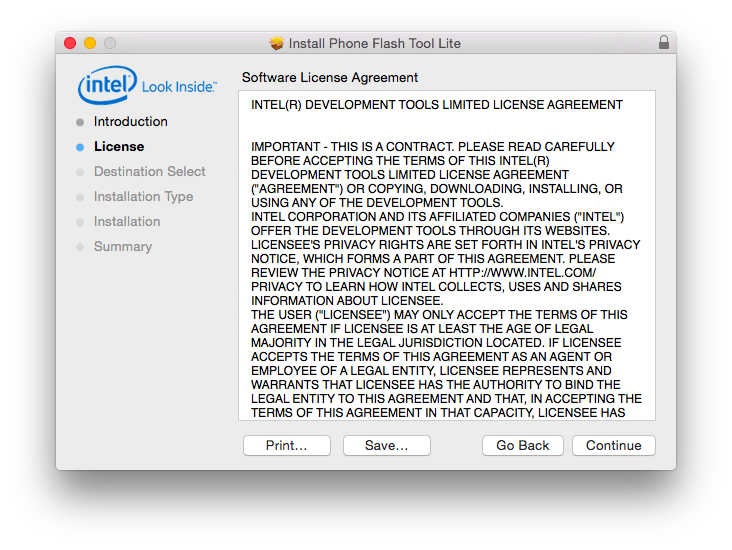 Accept the terms of the End User License Agreement, and accept all defaults until you are presented with a summary screen. 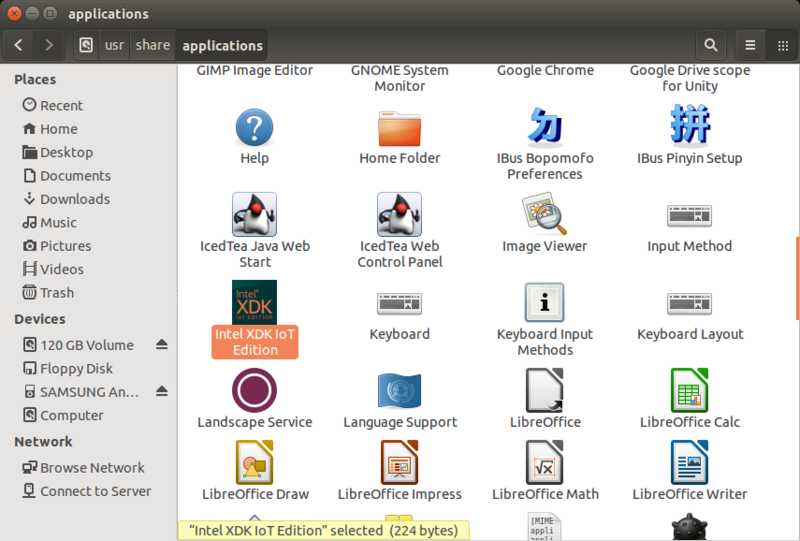 Click Customize installation, and accept the default installation directory on the next screen. You will be presented with some installation options. 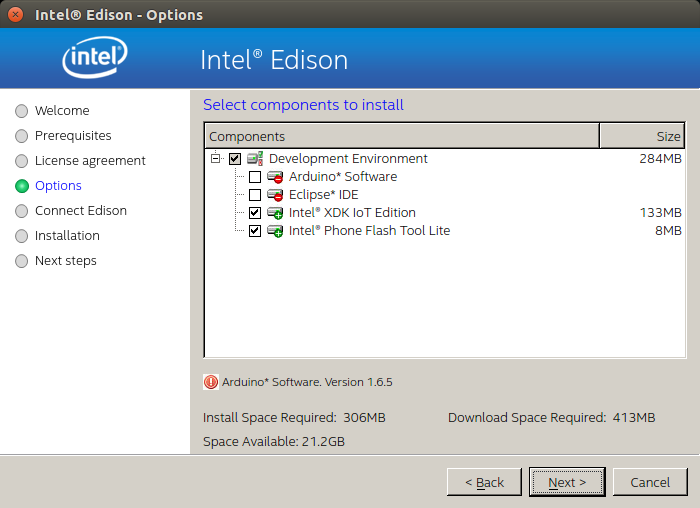 Deselect Arduino Software, and select Intel® XDK IoT Edition. Click Next. Deselect Update firmware image, and click Next. There is a chance that your system might be missing some dependencies (e.g. "Dependencies not resolved"). Wait for those to finish installing, and click Re-check on the missing dependencies screen. You should be good to install. 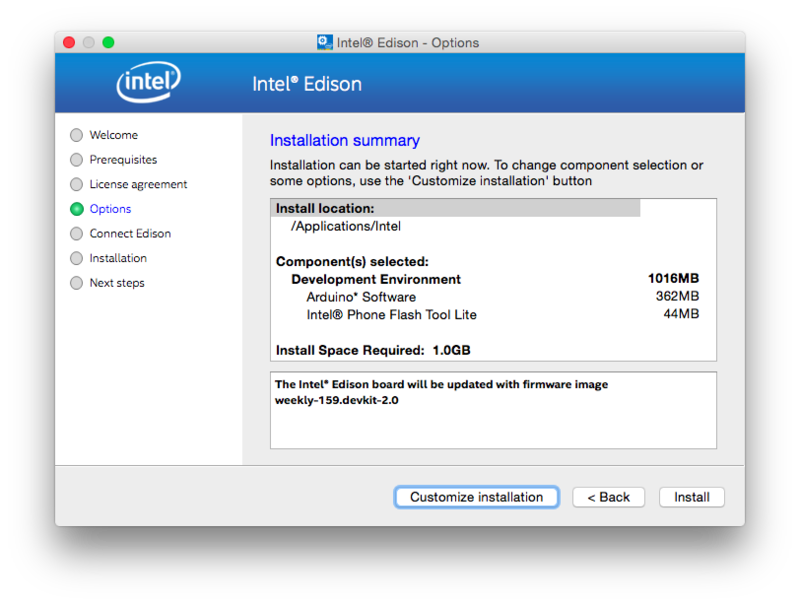 Click Install and wait for the installation to complete (clicking to accept any defaults on prompts). The XDK IoT Edition can be found in /usr/share/applications when the installation is complete. 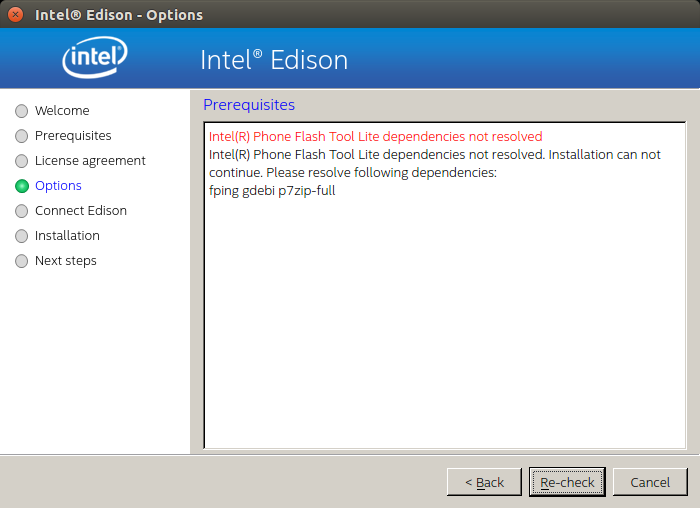 NOTE: If the Phone Flash Tool Lite failed to install, you can install it manually by following these instructions.